Social media: To encourage more students to use the space, Social media (facebook/twitter) is a captured audience and so using the main University of Plymouth social media accounts to attract more engagement with the space may be useful. 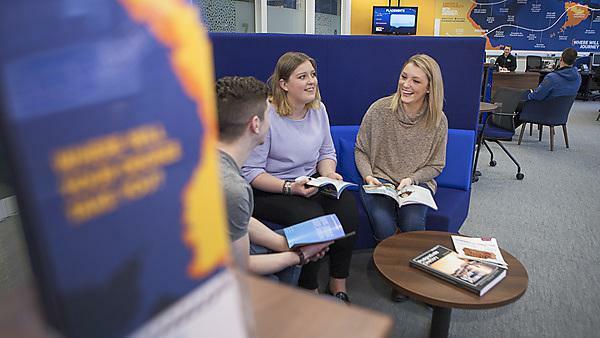 Welcome events: To encourage students to use the space and to understand what happens within the space it is suggested that a Freshers session explaining what the Hub is and what the CES team do in the Hub, could be helpful. As Freshers can be busy and contain a lot of information, it may be useful to hold a re-fresh session in January to update students on this information. Skype facilities: Skype use to be promoted more effectively. Students are interviewed and recruited through Skype interviews, but the facility in the Hub is not well promoted. Staff notice board: Staff notice board could have contact details of staff. If staff are off sick or very busy they may not respond in a timely manner and this would mean students could go without information that they could get through the main service email address. Students felt the position of the board is difficult to see inside the Hub and so placing it outside may make it more accessible. Availability of staff: Students felt they would like to see times the staff are in the Hub. Not all staff are based in the Hub, therefore it would be difficult to achieve this. But perhaps drop-in times could be clearer. Approachability: Some students felt they were not aware you can just come and drop in the Hub and feel you need to have a question and go to the desk rather than just wander round the space. They felt clearer signage above the desk may help this. (Help desk vs reception desk/welcome desk vs help desk). Furniture: Some students felt that the furniture is all the same in appearance and so hard to decide who to talk to. Student jobs: Students felt the Student Jobs desks are not very approachable; that there are no chairs for students to sit with Student Jobs staff. They also felt that they could be disturbing the team when working. It could also be helpful to have a Student Jobs desk that a student could sit at with a member of the team, rather than sitting with them at their desk. Welcome desk: Students felt that the welcome desk is very cluttered with information and that rearranging things to keep the desk clear would make the space more approachable. Consider having a board between help desk ad student jobs, although this might make the space become closed off. Infrastructure: The Hub is a very tall space and only the ground level used. Would it be possible to introduce a mezzanine? Pods are small; (designed for 1 to do own laptop/computer work) larger ones are used for 121) positive to have private space.Bin is at the end of the space and not well sign posted. Could this be moved to be more obvious? General feel of space: Space is open and approachable/welcoming. Professional and friendly space. Colour scheme is good. Tall sofas are nice confidential spaces and flexible for different uses. Jobs Board Materials: Students felt that the jobs boards that are currently in the windows are not accessible, and as the information is not the same on both sides you are not encouraged to come in and ask more about it. Students suggested that a pin board of jobs may make it look more dynamic. Students felt that in the current format, all jobs look the same and so it is assumed that it isn’t changed often. Maybe do different colours on different weeks or use company logos more boldly. Physical resources: Students discussed whether they still relevant. Overall they felt yes, but raised that only users of the space will be able to access them. Students felt that the ‘Career hack’ and ‘CV hack’ were good resources. Subject specific resources: science has historically not had many useful resources – maybe place resources at strategic course venues. E.g 001/006 Fitzroy Davy 7th Floor labplus, Portland villas (student reception areas and common rooms). Themed subject resources, use the theme and replicate information about what the space offers. Use the [HUB] logo more on literature.